You know how when you have a baby, your stomach deflates itself and your abs get flat after a bit of working out? No? Me neither. In fact, for me, the opposite was true! Instead of deflating and getting flat, my abs seemed to inflate and form a hill. I’ve been a member of no less than half a dozen gyms both before and after having kids, and I’ve done my share of ab workouts. When Zachary was not yet two years old and I was working out 4-5 times per week, I realized that as I lost weight and inches, my stomach seemed to be growing rather than shrinking. 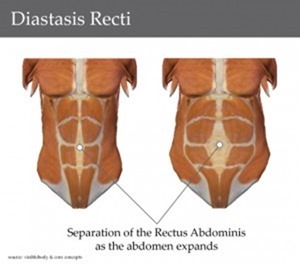 Soon after I noticed this, I was told by both an ob/gyn and a general practitioner that I had something called a diastasis recti. Separation of the muscles in the abdominal wall is common in pregnancies, especially after multiple pregnancies, because your muscles have been stretched multiple times. In most cases, it seems the muscles return to the center and the gap closes. Apparently, for me, this was not the case! I was also told at this time that I had a small hernia in my belly button. Neither the hernia nor the separated muscles warranted repair at that time, because I still planned to have more children and pregnancies obviously caused the problem in the first place. When I inquired at my gym about types of exercise that could help, my instructor did not know what to tell me. At that time, the problem wasn’t that obvious to others, though when I moved to Kansas I did experience for the first time a question from a well-meaning person in regards to whether I was pregnant. I explained that my muscles were separated and just made it look that way – sounds like a made up story, doesn’t it? 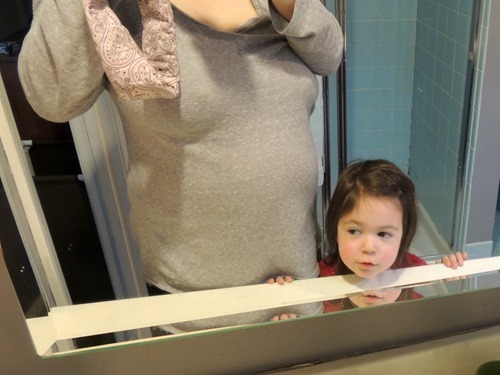 Well, soon after that I did get pregnant, and when another person thought I looked pregnant (even though it was probably too early for me to be showing), I was able to be happy to look pregnant – because I WAS pregnant! Not pregnant in this picture. After Simon was over a year old, the more difficult situations started to occur. 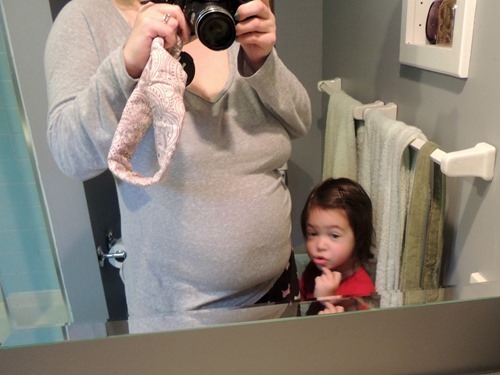 I would have hoped that at 18+ months post partum I would not appear to be 4-5 months pregnant, but the mom at a moms’ group event, the stranger in a parking lot, an employee at Costco, and the volunteer at the 1/2 marathon all thought my “pregnancy” was obvious enough to mention. I was working out 5-6 days per week again and to me, the more I worked out, the worse my stomach appeared. 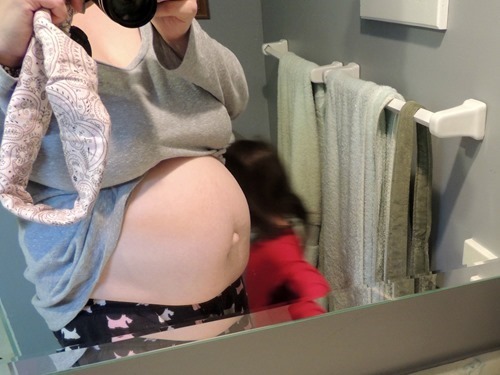 Maybe if the rest of my body was very overweight I would not have appeared to be pregnant, but being short and having average sized leg and arm muscles really enhanced the way my stomach stood out. I became discouraged from working out at all, when I just felt I was making things worse. It was after the comment at the 1/2 marathon (asking me how far along I was when I was not pregnant – people need to not ask that question ever!) that I finally decided to find out about fixing the muscles in my abdomen. I had an MRI and was told that my muscles were very far apart with only a thin fascia holding them together, plus there was a place where it looked like part of my colon was coming through – basically a type of hernia in the middle of my abdomen, as well as the hernia in my belly button, which I already knew about. The surgery required was a ventral hernia repair, as well as abdominoplasty to bring the muscles back together and tighten them, remove the excess skin from my abdomen, and reconstruct my belly button. You may know an abdominoplasty better as a tummy tuck. I did some reading about the procedure and referenced blog posts from Katie and Rachel, although neither had the exact type of problem that I did. It helped to read personal accounts from other bloggers though, which is why I decided to write about my experience as well. What both Katie and Rachel experienced that was the same as my situation is that diet and exercise did not help with the separated muscles in my abdomen and would not have helped no matter what I did. I was tired of standing with my arms crossed in front of my body and having to announce at social events that I was not pregnant so that people would not start to speculate. I was tired of hating myself. Within 3 months of my MRI, I had a surgery date set and was trying not to dwell too much on what I was about to put myself through! 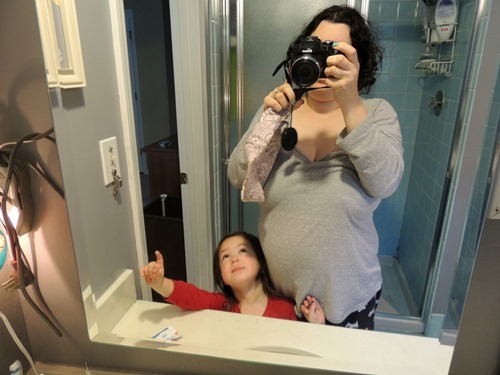 How pregnant does that belly look to you?